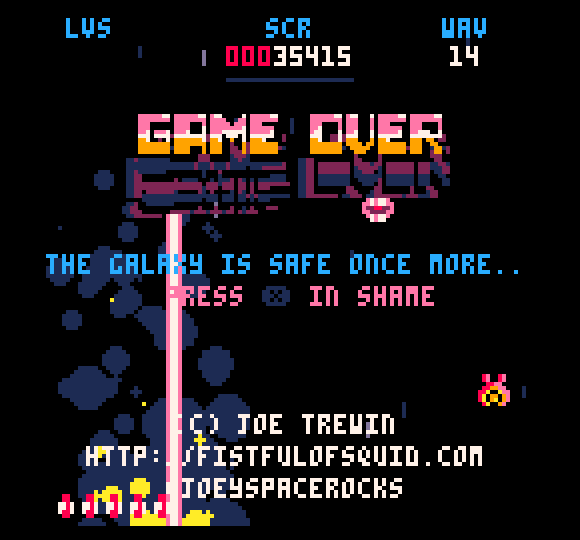 They Started It, is a frantic Pico-8 shooter from BBS member joeyspacerocks. Part space invaders part galaga, all action and sensory overload - this shooter delivers fast paced, wave based shoot em up fun in spades. The current version has a nice difficulty curve with the first wave easing you in gently but soon ramps up as enemies with a higher hit count appear and with better weapons such as missiles and beam lasers arrive to rapidly deplete your (short in supply) shields. You get pickups in the form of missiles and shields and extra lives on a points basis but the star of the show has to be extent to which it has been 'juiced' which is to take a simple game mechanic and layer on effects (explosions, shake, particles etc.) until the base game is almost unrecognizable and this one does it to great effect, as this is one of the most addictive offerings so far. As usual with pico-8 games, you can play them through the pico-8 BBS or download them if you own Pico-8 for the best experience. It plays on PocketCHIP but not at 60Hz which is a shame, but it does play unlike some other newer carts which need version 0.1.8 vs PChip's custom 0.1.7.